Seven years ago, a 15-year-old started a YouTube channel called rabbidluigi. He had no way of knowing that in 2017 that would be a real character in a real video game. Rabbidluigi is a gaming channel that does top ten videos and Let’s Plays. “In anticipation of making my YouTube I planned everything out,” rabbidluigi told me over Skype chat. “It only occurred to me when signing up and registering my YouTube channel that I completely overlooked what I’d like to call it. ... I threw the names of two video game characters I kind of liked together and ended up with ‘rabbidluigi.’” He said part of the reason why he picked this name all those years ago was because, at the time, the two franchises weren’t connected at all. 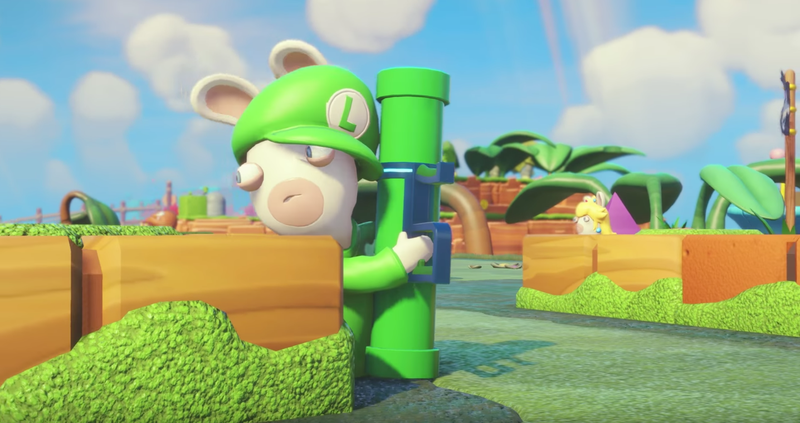 Shortly before E3, when Mario + Rabbids: Kingdom Battle was leaked to the public, rabbidluigi’s social media became “just an endless supply of jokes,” he said. “I don’t think I received a comment on a YouTube video or a mention on Twitter that didn’t bring it up. This avalanche only got more intense when Ubisoft demonstrated the game on stage at E3 and referred to the character as ‘Rabbid Luigi.’” His first video commenting on that E3 announcement had over 190,000 views. While his top 5 and top 10 videos are pretty popular, even those topped out at about 90,ooo. Rabbidluigi says that regardless of the kind of video he made, the comments would inevitably mention the unexpected upcoming game. To rabbidluigi’s surprise, he says that he was also contacted by Nintendo and Ubisoft about the coincidence. He was even invited by Ubisoft to come to their studio in Paris to play Mario + Rabbids at a marketing event. “I remember some commenters saying that I should be worried about Ubisoft suing me or sending a cease-and-desist,” he said. “The fact that Ubisoft found it hilarious as well is maybe my favourite part of this whole saga.” I reached out to Ubisoft for comment but they didn’t respond in time for publication. He’s since reviewed Mario + Rabbids, cheekily addressing the coincidence, but by this point, he’s ready for the joke of his username to fade away. “While the increased engagement on my channel has helped me a lot, I’m partly grateful that this story will come to an end once everyone has gotten used to it,” he said. “I suppose it’s a fun feature to mention when meeting new people in the industry, but I still don’t want my channel to be defined by it.” At the moment he’s gearing up to launch a second channel that will host all his Let’s Play videos. Even if he’s ready to move on, he still finds the whole situation funny.